The Tarzan party is searching for Brian Gregory, the lost archaeologist. 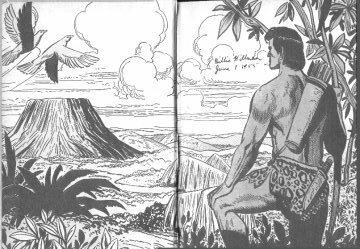 Atan Thome and Lal Taask, who believe Tarzan to be Brian Gregory, are following. During D’Arnot’s recital of Tarzan’s past the expedition is endangered by stampeding elephants. Tarzan leads the elephants away from the encampment and returns riding the leader of the herd. After the other members of the party have gone to bed, Wolf apparently convinces Magra that she must steal the map of Ashair from Helen Gregory. Magra consents and cautiously enters Helen’s tent. Magra enters Helen Gregory’s tent amid lion roars and other jungle night sounds. She awakens Helen and tells her that she knows about the map and to warn her that for her own safety she must give it to Tarzan for safekeeping. She reminds Helen that Tarzan – a man who kills lions and tames elephants – would be in no danger. A strange murky flavour hangs in the sultry air of the African night. The jungle seems to murmur and breathe its scented breath across the soft dark world. Presently, over the sleeping camp, the night shadows meld into the early grey of daybreak, which in equatorial Africa is almost as short as the lighting of a candle. The patterned roof of the forest is etched in the timid green of dawn as the expedition once more gets underway. Wolf strides along beside Magra before taking up his post at the rear of the column. Magra reports that she could not find the map in Magra’s tent the night before and Wolf suspects that Mr. Gregory has the map. Gregory expresses his frustration with the jungle heat and the slow progress of the safari. When Wolf takes up his position at the rear he is surprised by Thome who expresses his displeasure at the German’s inability to obtain the Gregory map. Thome orders Wolf to enlist the witchdoctor’s aid in persuading the native bearers to desert the Gregory safari. This would result in the Gregory party being left alone and unprotected in the jungle. Tarzan, with D’Arnot and two hunters, is leading a jungle expedition in search of Brian Gregory. In the party are Brian Gregory’s father and sister, Helen. Magra, a mysterious Eurasian girl, is also with the Tarzan-Gregory safari. It is through Magra that Atan Thome hopes to get possession of a map showing the location of the Forbidden City of Ashair. In their camp on the bank of a tributary of the Ubangi River the whole group is watching a native ceremony when Larson the Swede hunter spies a giant crocodile coming toward them. With his gun ready, Larson heads for the monster. He slips and falls directly in the path of the approaching crocodile. Shouting, “Kreegah,” Tarzan leaps in front of the snapping jaws of the monster. The ape-man grabs the jaws of Gimla in a steel grip and while the beast threshes about wildly, he pulls back the head until the vertebra snaps. The rest of the party watch in spellbound silence as Tarzan screams the victory cry, “Tarmangani.” The rescued Larson is forever indebted to the ape-man. Meanwhile, Wolf meets with the witchdoctor after the natives have been quieted. Wolf buys a flask of the witch doctor’s potent brew. He then talks the witch doctor into leading the bearers in a desertion. Wolf then sees Helen pass a folded paper to her father and this leads him to inform Magra of his plan to attack the old man and to enlist her as a lookout. Back in Thome’s camp, he and Taask go over their plan to supply liquor to the Gregory bearers and to convince them that the Gregorys are evil spirits so that they will turn upon them. Thome coerces Taask to agree to lead the native bearers in their revolt. At the Gregory camp while Larson is recounting his jungle exploits, Wolf sneaks to Gregory’s tent where he fills the man’s canteen with the witch doctor’s drug. Magra having watched Wolf’s every move, goes in to swap the German’s canteen for the drug tainted one in Gregory’s tent. Tarzan is leading an expedition organized to search for Brian Gregory into the Belgian Congo. Among the party are Gregory’s father and sister and following them are Atan Thome and Lal Taask who are determined to get possession of a map showing the location of Ashair. They believe Tarzan has this map. In camp, on the banks of a tributary of the Ubangi River. Tarzan kills a crocodile in defence of Larson. Wolf secures a sleeping potion from a native witch doctor and puts it in Gregory’s canteen. Magra exchanges Wolf’s waterbag for Gregory’s. Next morning, Larson comes from his tent and calls to Tarzan. Larson reports to Tarzan that he can not wake Wolf. Suspecting he has been drugged they discover that his canteen is full of the witch doctor’s potent brew. They treat him with an anecdote and help him walk it off. 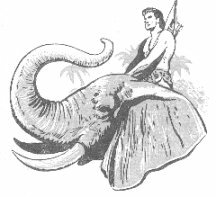 Tarzan tells of a similar experience he had many years ago when he ate bad elephant meat and had nightmares involving Histah and Sabor. They decide to delay the march to give Wolf a chance to recover and to provide a much-needed rest for themselves. While Tarzan watches for crocodiles, D’Arnot, Gregory and Larson take a swim in the river. The girls remain back at the camp, sewing while they discuss the prowess of Tarzan – Magra appears smitten. Helen admits that she hasn’t passed the map to Tarzan yet. Wolf, still trying to figure out who swapped his canteen for Gregory’s, takes a whip and sneaks into the witch doctor’s tent. The men return from their swim to learn that Magra has seen Wolf headed for the native quarters – Tarzan follows him. Wolf, in his attempt to learn who had poisoned him the night before, is interrogating the witch doctor with the aid of a whip. He is grabbed from behind and spun around to look into the fierce eyes of the ape-man.